The first of Monday's contingent of naval ships for Joint Warrior 092 was the British carrier ILLUSTRIOUS, which was seen passing Cloch Point with five Sea Harriers and a Merlin helicopter embarked. 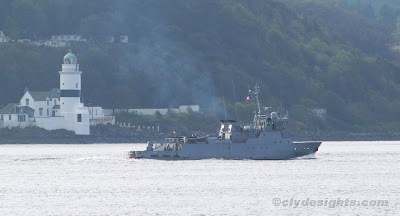 She was followed by a small French ship, STYX (M614), a mine-countermeasures divers' tender belonging to the 'Vulcain' class. She was built in Cherbourg and entered naval service in 1987. Two 'Arleigh Burke' class guided missile destroyers from the US Navy are taking part, and this view shows RAMAGE (DDG-61) as she made her way out to sea, with one of the Ministry of Defence police launches in attendance. 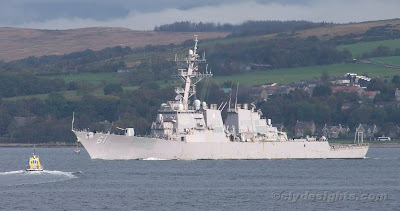 One of the early batch of the class, designated 'Flight 1', RAMAGE was built by Ingalls Shipbuilding in Pascagoula, Mississippi and was commissioned in July 1995. The other member of the class taking part is COLE (DDG-67).